Are you afraid of asking for samples from beauty counter? 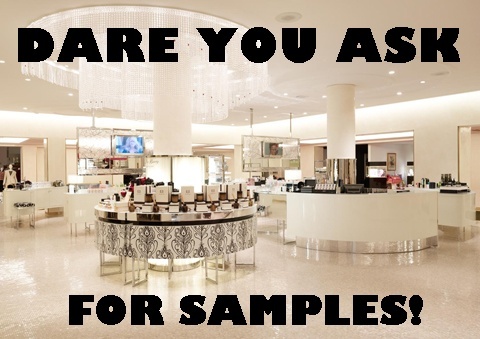 Today I'm going to open up this topic for discussion.... Do you dare to ask for samples from beauty counters??? Before you tell me your point, let me tell you mine first. I loath asking for samples from beauty counters. This issue came into my mind a few nights ago when I was asking my bff what moisturizer she is using and if it is nice. She told me she is using Clarins and she said I can ask for the samples from the counter before purchasing it. My reply to her, "Ahhh... no need lah. They sure won't give one!" Everytime I ask for samples I feel intimidated and ridiculed by the sales assistant to the point that it became a phobia. But at times, I really don't want to spend on the product first before trying it, especially when it is an expensive product. I can't calculate how much I've spent on products that don't suit me and I ended up avoiding the brand completely. Many years ago, I went to Clinique counter to ask for the sample for their moisturizer. Their moisturizer is a well known one. One bottle cost RM100+, being a student, RM100+ is not cheap. I had to work for a week for a bottle of moisturizer. The SA told me they don't give out samples (which I know they do because my cousin got it from the same counter). Not only that they didn't give me the sample, the SA was pushing me to buy it. She said, "If you want to try then buy lah!" Maybe not the exact words, but something like that. Since I was young and naive, I went on to purchase a full size moisturizer. The moisturizer ended up causing break outs and my skin texture turned really awful. Everytime my acne burst, there's a hole on my skin. Luckily after few years, the hole is not so significant. It was so bad that I'm not willing to purchase anything from Clinique again. Those two events are the one that I can remember on top of my head. There are a lot more occasions which I got brushed off by SA as if I can't afford to buy their product. 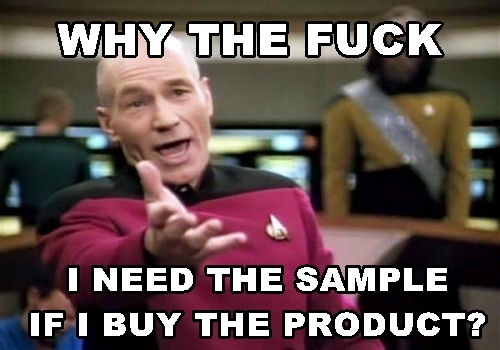 I know there are a lot of people who abuse it by asking for samples without buying. However, it is really not fair to those of us who genuinely want to try the product. And I know that's why we have beauty box service. But beauty boxes don't overcome my problem. Most beauty boxes only give out products that hardly sell, which is not what I'm looking for. Moreover, most of the samples are cheap product even if it is in full size. I don't mind paying for a full size one to try if it is cheap. How about you? Do you dare to ask for samples from the SA? Do you have the same bad experience as me or is it just me? 你的那个图案太有梗了, 不过认真来说我还真的不敢去索取试用装, 看到那些小姐的脸, 我觉得很恐怖, 她们的脸都在告诉着我如果你不想买请你不要和我说话 = ="
I would try not to be intimidated by SAs because sometimes, some of them have no knowledge on certain products. If I were you, I'd go back to that Clinique counter and show how her decision of not giving samples made her lose one potential customer. Who knows what if you'd like their other products, am I right?? That's so annoying though. I'd be brave enough nowadays as a consumer to really think about skincare. They can't push us to buy. Unlike makeup, skincare can easily either work or not work for you. I now say "I used to have very bad skin so I'm more careful with what I buy for my skin. If you have any samples, that'd be nice (while buying maybe a lipgloss or something small) because I don't wanna risk any bad breakouts"
And I find that it works. Sometimes. So yeah, try and be more catty if they're catty with you. Or be nice and just say "No thank you. If you're unwilling to give samples, maybe the product is selling bad so you're forcing me to buy." I seldom get sample from counter but sometimes when there is product launch and voucher is given to redeem samples, i will try. I just do not know how to ask them to give me sample if it is not stated that I can get sample. BTW, damn agree with the Captain, why do i need sample if I am going to buy a full size eh?? most of the counter here in Malaysia is very stingy so i don't really ask though.. I seldom ask for samples unless my friends or family member is purchasing something from them. "the more expensive the brand is, the more cocky the sales assistants are...."
SO TRUE! I dont know why most of our SA here in Malaysia are like... i dont know how to describe but... somekind of the service make me feel not welcoming and the knowledge they have is only to make sales! I dont ask for opinion from SA apa lagi samples! haha! thats why blog comes in handy, i have to do a full research before buying it, no chance to get samples, so research is the only option. yes, same with u, Jerine. I don't dare to ask for sample unless I have voucher or email proof. But I met a Estee Lauder SA @ parkson JB, she is so kind and friendly to me when I redeemed my sample and let my tried the tester one by one but she still passed me other sample when I left without purchase anything that time.